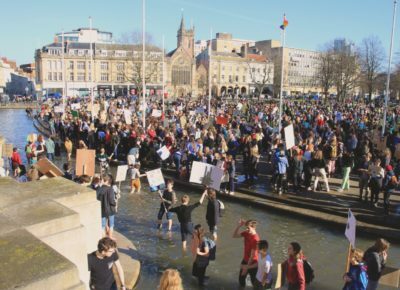 Between 11am and 2pm on Friday, hundreds of young people gathered on College Green in the center of Bristol to form part of the global ‘Strike 4 Climate Action’ movement. The movement was founded by the Swedish environmental activist Greta Thunberg, a fifteen year old who missed school to protest alone outside the Swedish Parliament in August. It has since gathered support from influential figures such as Christiana Figueres, who led the 2015 Paris agreement. Despite many schools objecting to students leaving school during the middle of the day to attend this protest, the numbers and spirit of the protest were clearly not too seriously damaged as cheers and chants flowed around College Green. Students were venting their frustration on what they perceive to be inaction from the government on what is considered by many to be the problem of the generation: climate change. The protest took place outside the Bristol City Council Building. Although the UK is progressing faster than many countries on reducing emissions and becoming more environmentally sustainable, it still needs to improve. As the Committee on Climate Change writes, ‘Meeting future carbon budgets and the UK’s 2050 target to reduce emissions by at least 80% of 1990 levels will require reducing domestic emissions by at least 3% per year. This will require existing progress to be supplemented by more challenging measures’. Or, as the popular speaker at the Bristol event, Green counsellor Eleanor Combley put it, ‘deep change’ is necessary. Unfortunately, it is unlikely that this recent wave of protest will force the government to take more action on climate change; nonetheless, it showed that young people are not willing to stand by as generations, who will not experience the full ramifications of their actions, destroy our planet. Often, ‘Millennials’ or members of the ‘Snowflake Generation’ are more frequently associated with phones and social media than social and environmental conscience. Whilst this is certainly true to an extent, with half of 18-24 year olds admitting they regularly check their phone in the night, actions such as this protest serve to disprove these stereotypes. Ultimately, the actions on Friday by more than 10,000 young people nationwide proved that young people want their voices to be heard. Having seen the failures of previous generations, young people want to take the future into their own hands. Given the shambles of modern government, who can blame them for wanting to take control? Sadly, we are living in a world that is continually and rapidly edging towards the precipice, the point of no return, that will result in the world becoming uninhabitable. It makes the issues which are consuming most of today’s energies, such as Brexit, seem rather trivial. Watching a group of people, of whom most, let’s be honest, are powerless, wholeheartedly campaigning for something they believe in, is refreshing. Perhaps they act as a lesson for those who hold the actual power in Westminster.